I’m all about new water-based experiences this year! I started out with my first experience on a huge cruise ship (where I also got married), crossing from New York to Southampton. 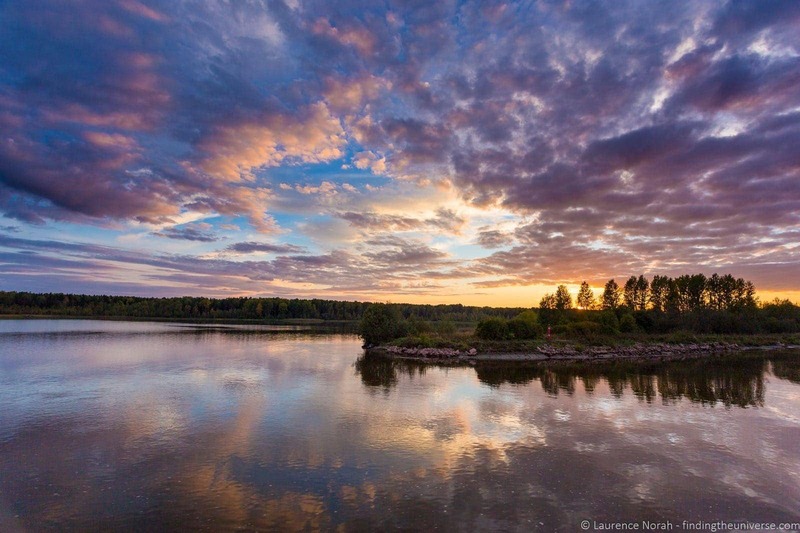 A few weeks later, we headed to Russia, where we experienced our first ever river cruise, sailing aboard the MS Rachmaniov on a river cruise from St. Petersburg to Moscow, as guests of Gvidon Tours. As I’d never done a river cruise before, I didn’t really have any idea what to expect. I figured it would probably be like a coach tour, but on a river. With, presumably, some older people. We’d see some sights, eat some food, meet some people, talk about the war – that sort of thing. It would also be fun to travel from St. Petersburg to Moscow by boat, as this is a big section of Russia that we’d never experienced. So lots to look forward to. And, as it turned out, I ended up enjoying myself a great deal. 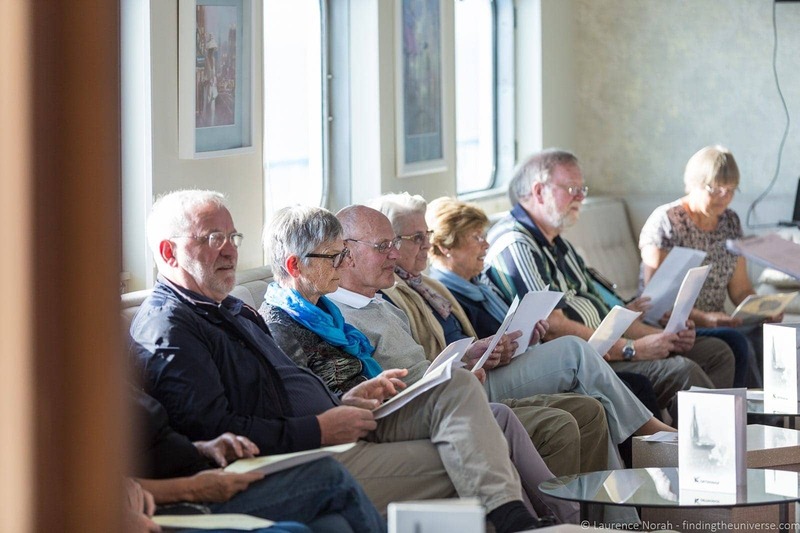 There were, in fact, many older people – this relaxed style of travel clearly appealing to a more mature audience, and I’d say that 60+ was the main age group. This wasn’t really a problem for us, as I’ll happily talk to anyone, and we met some lovely people – more on those in a bit. The overall experience was also a lot of fun, with plenty of time to relax, sight-see, and socialise. 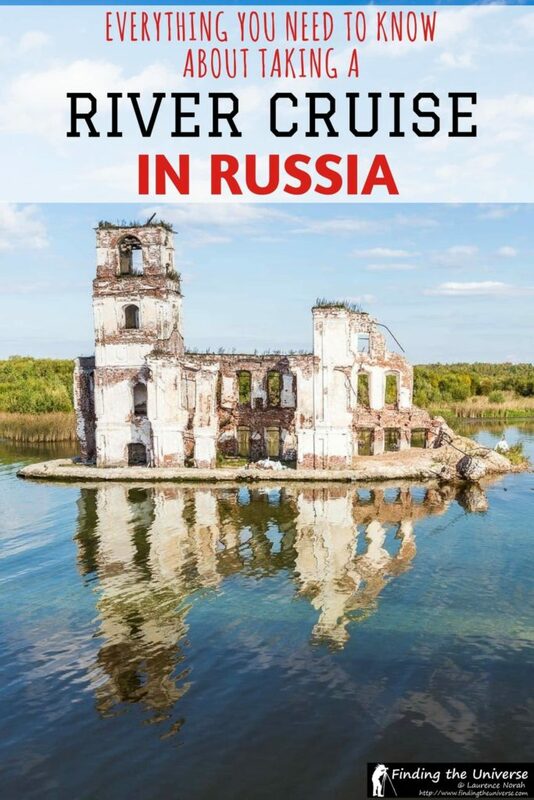 Let me dive into the details of our experience, to see if cruising in Russia might be something for you. 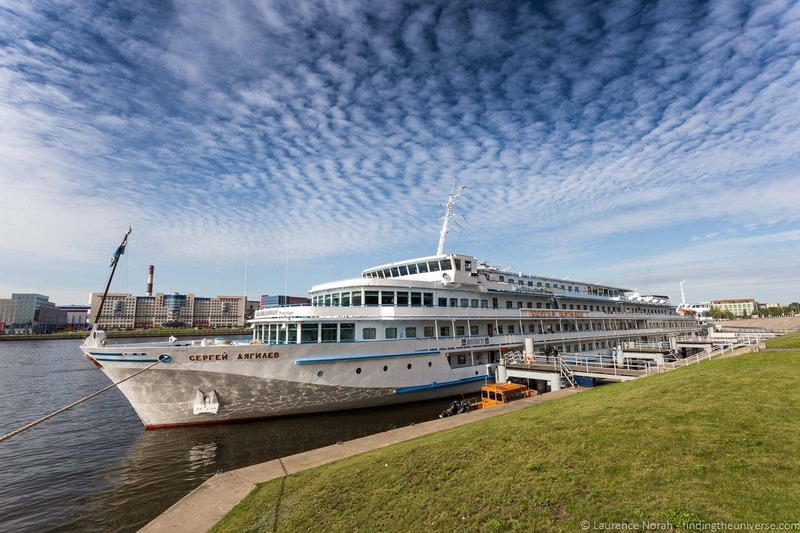 The MS Rachmaniov, so the brochure tells me, is a purpose-built river cruise ship, constructed in Germany in 1981. From our observations of other boats on the river, it’s a pretty typical design and layout. 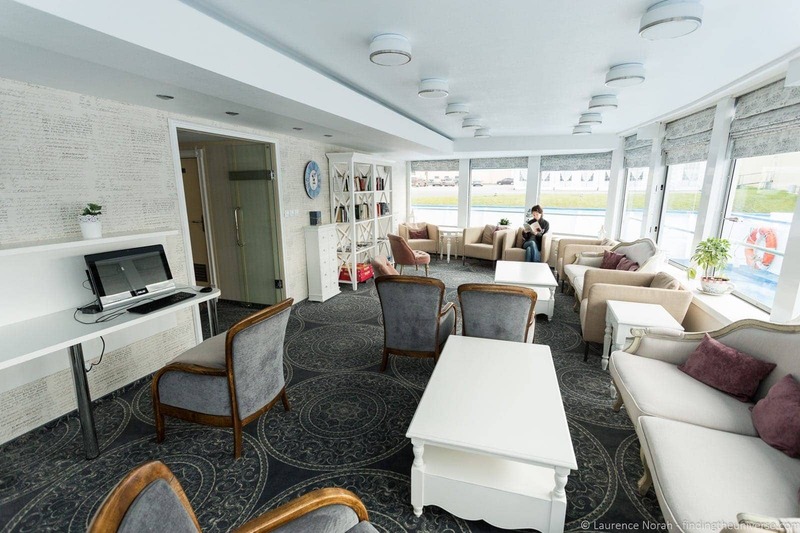 This particular ship was totally refurbished in the year 2000, and then modernised and updated again over the Winter of 2013/4. 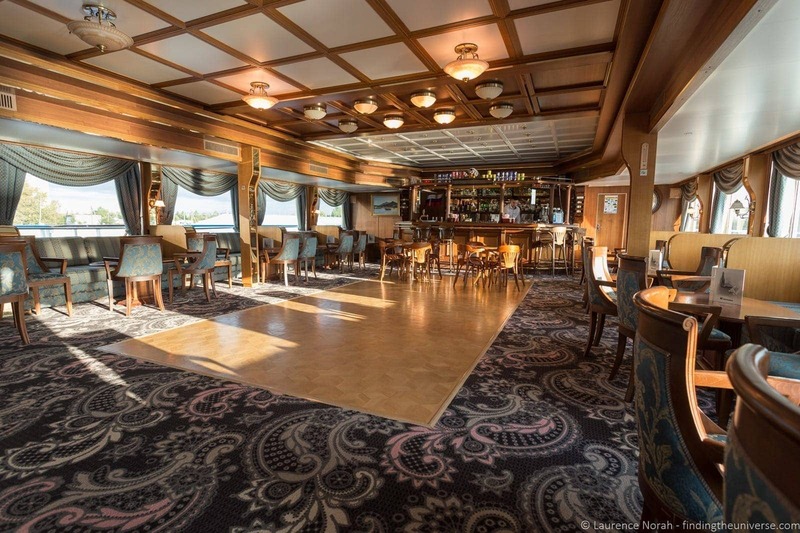 We were certainly impressed by the overall decor, and the ship felt new and modern throughout. 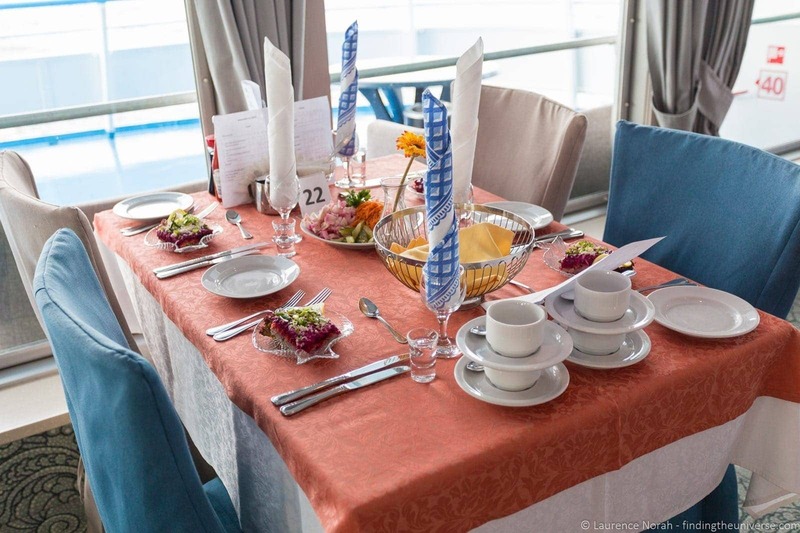 The ship is designed to accommodate up to 200 passengers and 91 crew, and comes with everything you’d expect from a modern river cruise ship. Let’s look at some of those details. 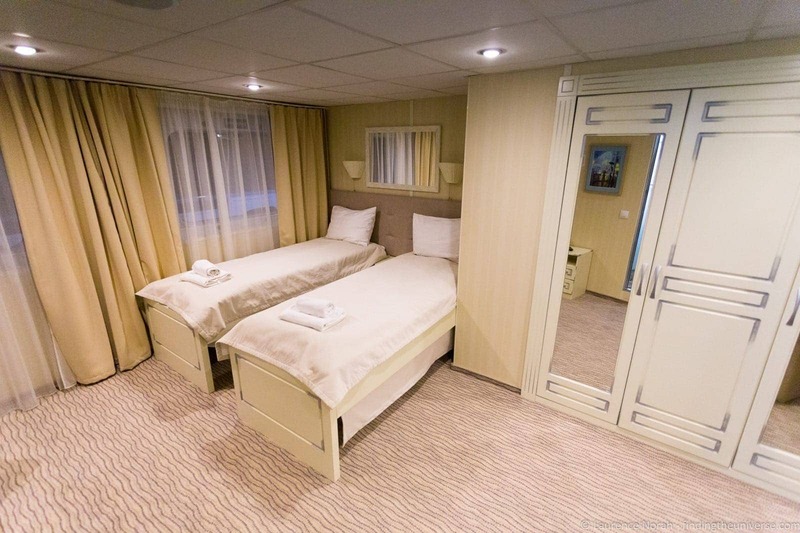 There are three classes of room on the MS Rachmaniov: Junior Suites, Double Cabins and Single Cabins. We stayed in the Junior Suite, which as you can see from the pictures had loads of space – 20 square meters of it in fact. We had two twin beds (pushed together to make one bed), a sofa, lots of wardrobe space, a small fridge, a safe, a bathroom with a shower, and a desk to work on. We also had two large windows to watch the world go by from. Our room was really a wonderful haven, and I really loved how we could stay in the same place for ten days without needing to pack up and repack, and still have different scenery and activities going by. The Double and Single cabins are a lot smaller, at 9 square meters and 8 square meters respectively. They are really more for sleeping only, featuring either one or two single beds and a bathroom, but don’t come with a fridge or desk area. 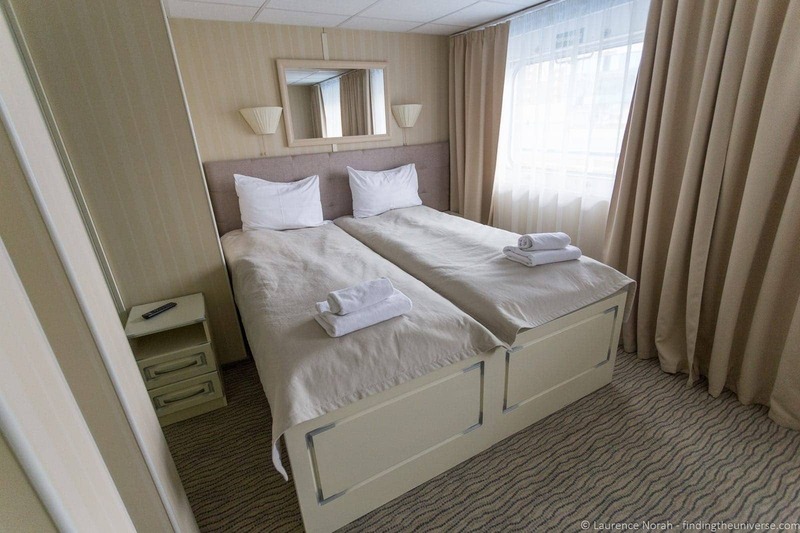 The good news is that there are plenty of places on the boat where you can sit and relax, so if you are on more of a budget these rooms are still very nice. All the rooms come with a TV (don’t expect any English language programming apart from a four part series on the history of Russia), a radio, air conditioning and heating. 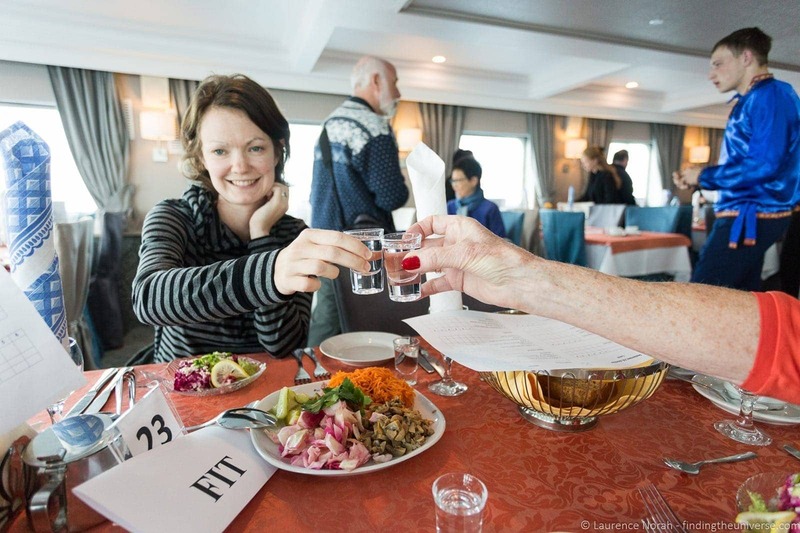 During the cruise we had three meals a day, a buffet breakfast, and then two meals served to the table. A menu would be presented to us the day before, and we’d have to make a choice from two options for a starter, a main course and a dessert for the following day. Every meal also started off with a salad, making them all four courses long, accompanied by bread. The food was certainly of good quality and we got lots of it – no-one went hungry, that’s for sure! In terms of what we ate, well, soup featured heavily as a starter, and then there were various options, usually a meat or fish dish, accompanied by some form of potato and some form of vegetable. We never ate the same thing twice, and the service and presentation were good. One thing to note – Russian food features a lot of dill. And potatoes. If you don’t like dill or potatoes, you are going to be in trouble. If you’ve got any food allergies (we don’t), just let your host know, and they’ll ensure you get the right food. One chap on our tour had an allergy to peppers, and his meals would come (usually!) without peppers, although if you have a really serious allergy you might want to check in advance to be sure they’ll be able to accommodate you. One definite criticism that caused grumblings amongst fellow passengers was the water situation. The water in the taps on the boat wasn’t drinkable, so the only way to get water on board was to pay for it. At €1 per litre, it wasn’t massively expensive, but I know a number of guests were upset that drinking water wasn’t available, even with a meal, unless it was bought. 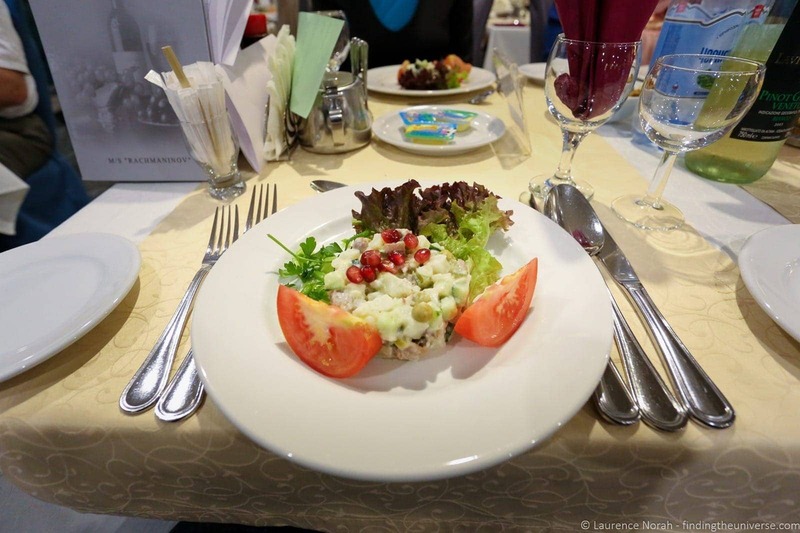 The only exception to the food that we didn’t overly enjoy were the packed lunches on the trips from the boat in Moscow and St. Petersburg (although you did get a free bottle of water!). We heard similar feedback from other guests. It wasn’t that the food was bad, it just wasn’t very interesting or imaginative. We’d suggest taking some roubles with you and picking up a snack while you’re out, if you go down this route. 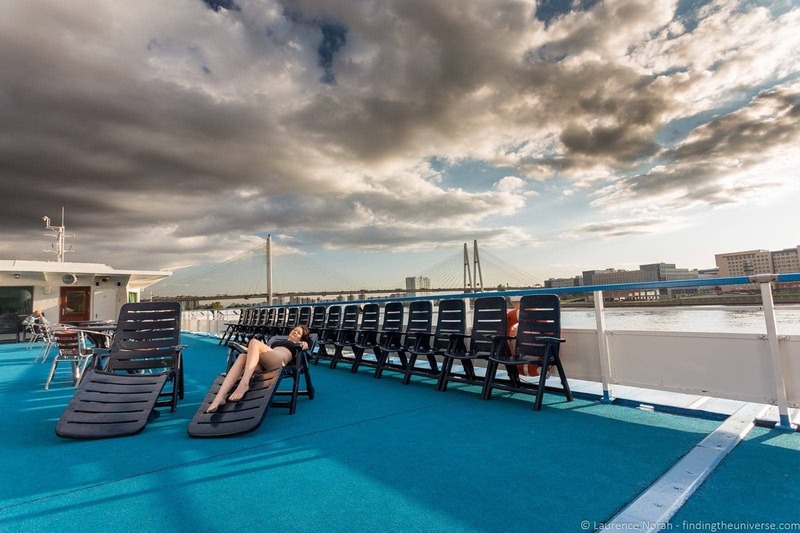 On a cruise like this there are two types of people you’re going to be interacting with – your fellow passengers, and the staff on board. More on the people we were cruising with shortly. First, let’s talk about the staff. Everyone on board is a part of some sort of group. This is either based on who you booked the trip with, or, as in our case as we were travelling independently, was done based on language. We were part of the English language group, which was in the minority – there were between 15 and 20 of us from all around the world. 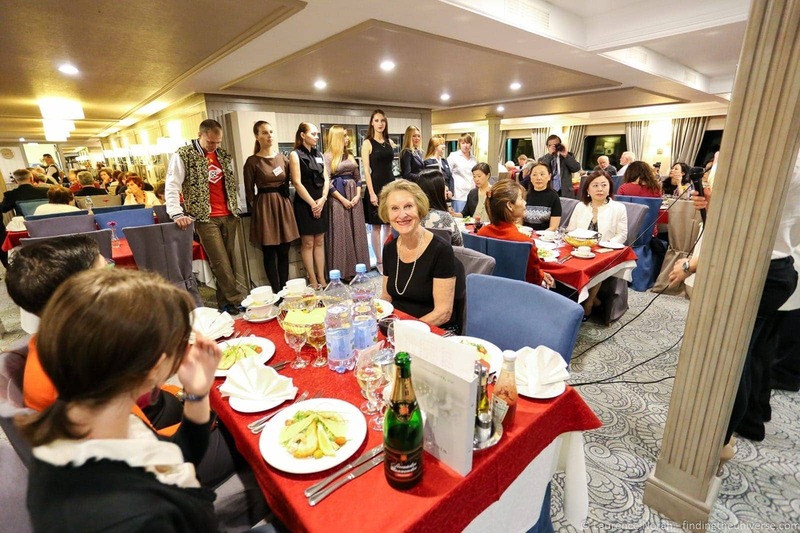 Each group has its own host on board the ship, and our hostess was the lovely Victoria. Victoria was responsible for making sure that everything went smoothly, arranging shore excursions, and dealing with any problems anyone had. 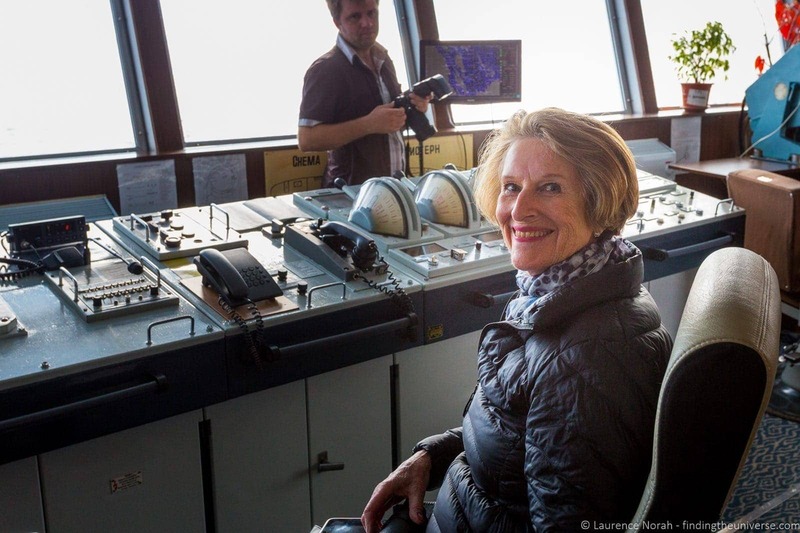 She was also the main interface between us and the crew, as English wasn’t widely spoken. The fact that most of the rest of the crew didn’t speak much English wasn’t really a problem though. They were all wonderfully friendly, polite and helpful, and certainly contributed towards making the experience what it was. The ship had free Wi-Fi throughout, which was obviously very helpful for us. 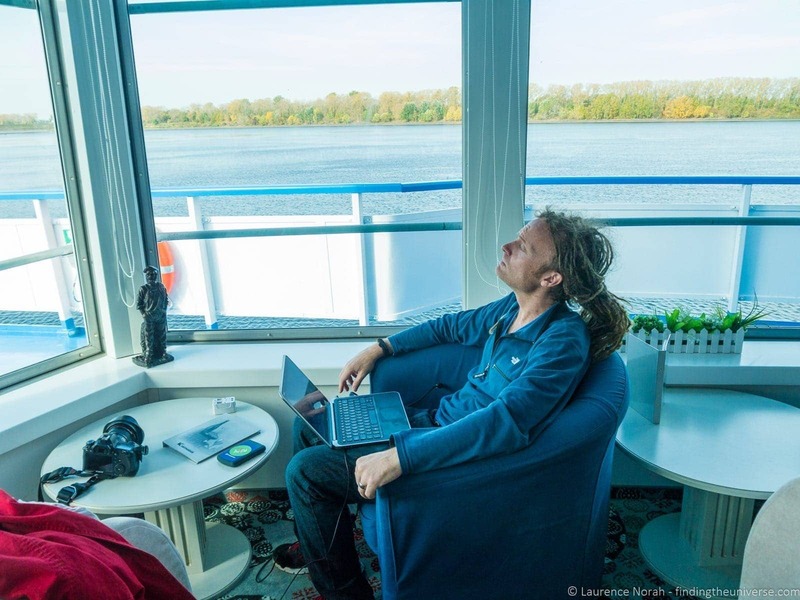 From time to time it would drop out, usually when we were crossing some vast lake, or deep in the middle of the Russian countryside, but for the most part we found it was perfect for our needs of uploading the odd photo and downloading our e-mails. Other guests used it to download their daily newspaper and update Facebook accounts. It wasn’t fast enough for tasks like video streaming though. Power sockets were available throughout the ship, with a European style two pin plug putting out 220v. There was only one in our room, so if you want to plug in multiple devices, bring something like this along, and of course a travel adaptor if you need one. There was a library on board, however it only had two English books. If you like to read, I would very much recommend taking along a Kindle or something similar, and loading that up. 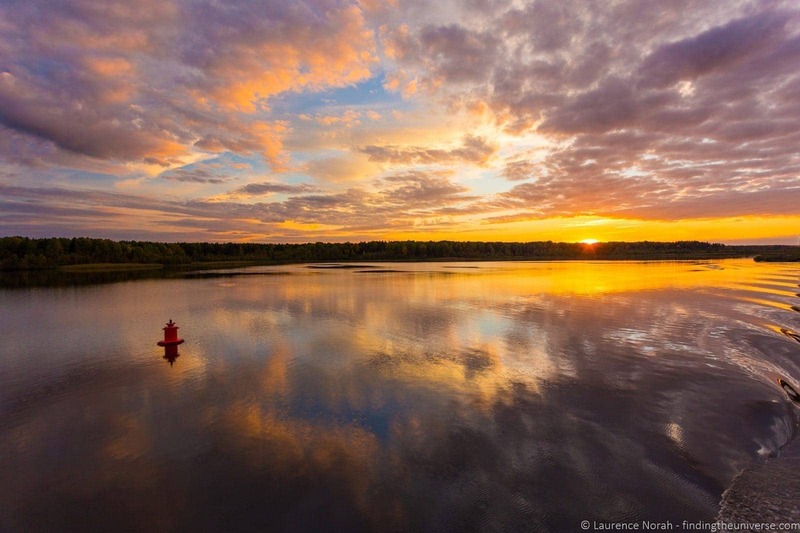 You’ll have plenty of time to relax on the boat, and there are some nice locations on board to sit and while away a few hours in a book, as the scenery floats on by. 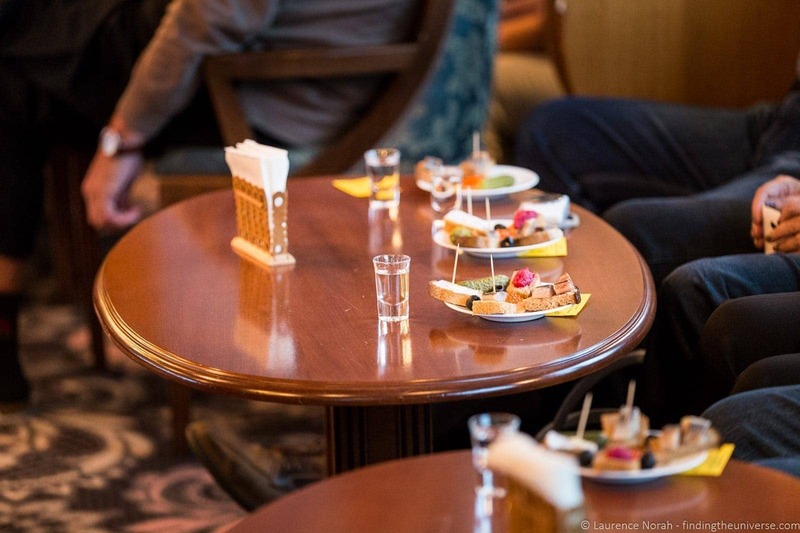 Speaking of locations on board, there were three bars / lounges on board, as well as a large sun deck at the top of the boat. These served up everything from “proper” coffee, through to a selection of beers, cocktails, wines and soft drinks. Prices were in Euros and fairly reasonable, around €2 for a coffee, €3 for a beer, and in the region of €15 – €25 for a bottle of wine. There was also a souvenir shop selling various items, from Matroska Dolls through to jewellery, as well as maps of our route and books about the cruise itself. 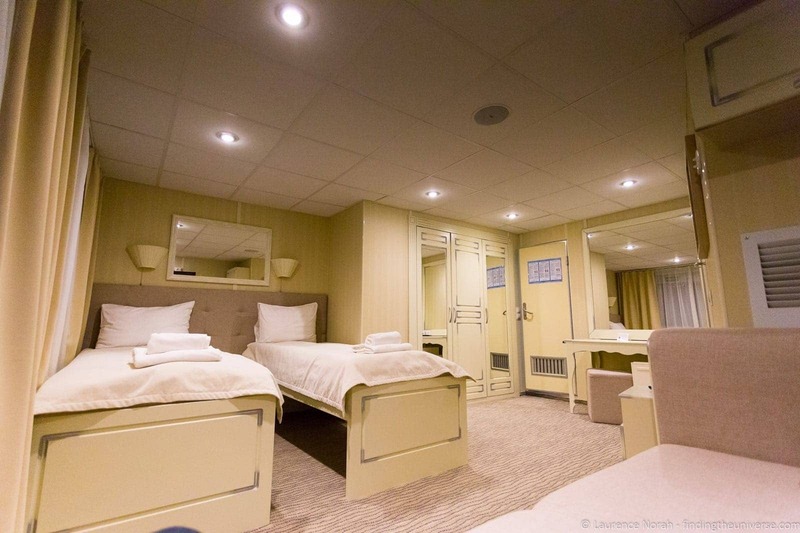 In addition the ship had an on-board doctor and medical room as well as a small beauty salon / hairdresser. 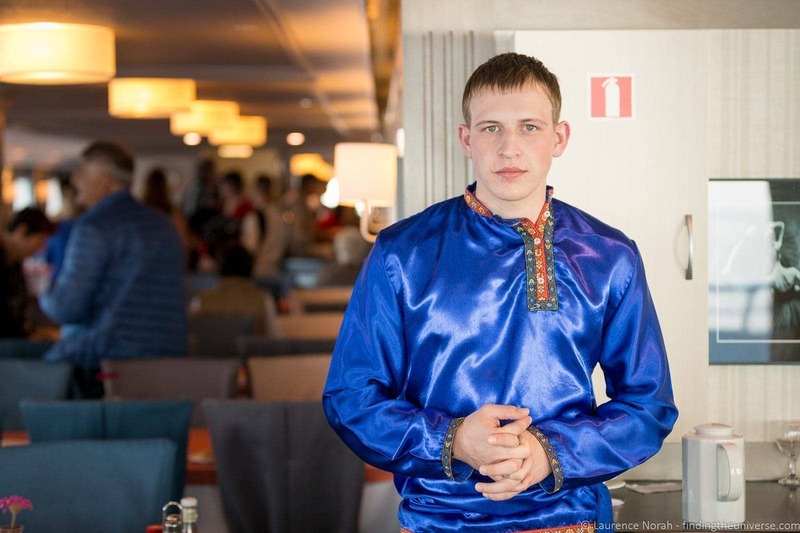 The other passengers on the boat comprised a variety of nationalities. German and Italian were probably the largest two groups, with the remainder made up of a mix of nationalities including American, English, Australian, Russian, Austrian and Taiwanese. As mentioned before, the groups were split up generally by nationality, both for tours, and also for seating. 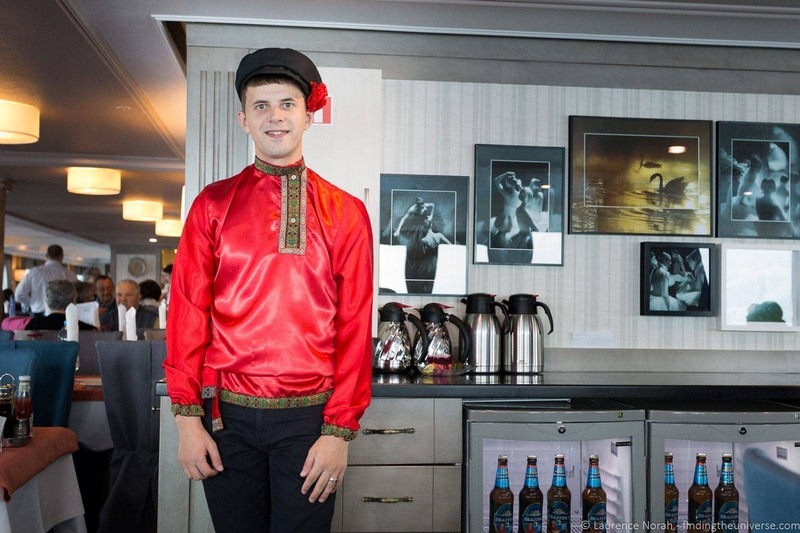 For events involving the whole ship, like the Captain’s welcome reception, this caused a slight issue, because everything had to be translated into five languages to cover everyone on board, which slowed things up a bit. 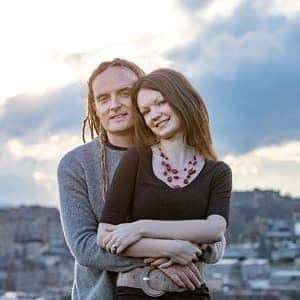 Not the end of the world, but something to know about. Our main interaction was obviously with the English speaking group, and was during tours and mealtimes. On the first night, we were told to choose a table, and then stick to it for the rest of the trip to make everything easier in terms of meal ordering. Obviously, polite chaos ensued for the first couple of days as folks adjusted to different tables and found themselves choosing who they wanted to sit with. We ended up mostly sharing our table with two lovely ladies, the magnificent Diana, a lady from the UK, and Isabel from Portugal, who was actually a tour leader for some of the English folk who had booked through a different agency, but were all part of the “English speaking” group. Depending on your personality, being lumped into a social situation without much choice can be a challenge, and whether or not you enjoy this sort of thing is really down to you. 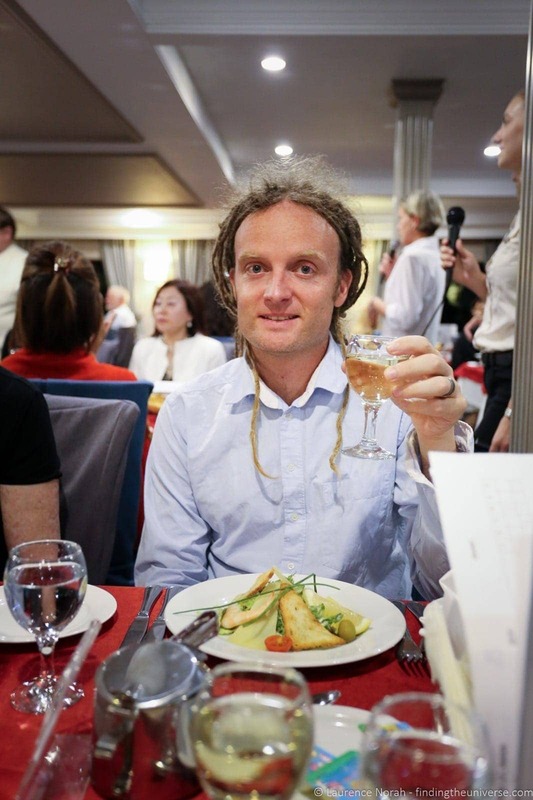 I quite enjoy socialising and meeting new people, and we were lucky to have some interesting companions to share our table with. Jess sometimes finds it a bit harder, and in particular as she speaks quite softly sometimes (not to mention very quickly! ), had a little bit of trouble being heard by some of the more elderly travellers, which posed some challenges to the flow of conversation. As it was, we ended up having a lot of fun over mealtimes, comparing notes from the day, learning about the lives of our fellow travellers, and talking about everything from TV shows of the eighties to the differences between the Guardian newspaper and the Times, and what that says about you as a person. There was never a dull moment, and mealtimes quickly became something I looked forward to, and not just for the prodigious quantities of food! There were a multitude of opportunities to take tours from the boat throughout the trip. 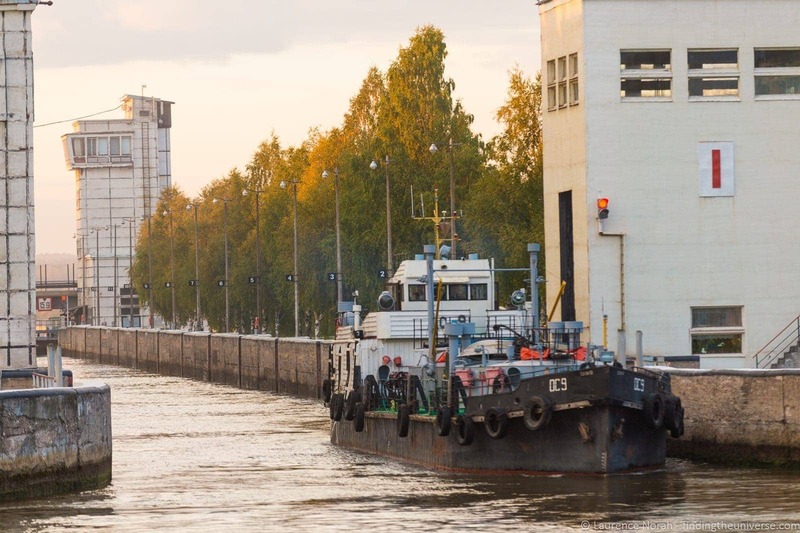 The cruise started in St. Petersburg, and we had two full days there, followed by five full days of actual cruising, and then two full days in Moscow. 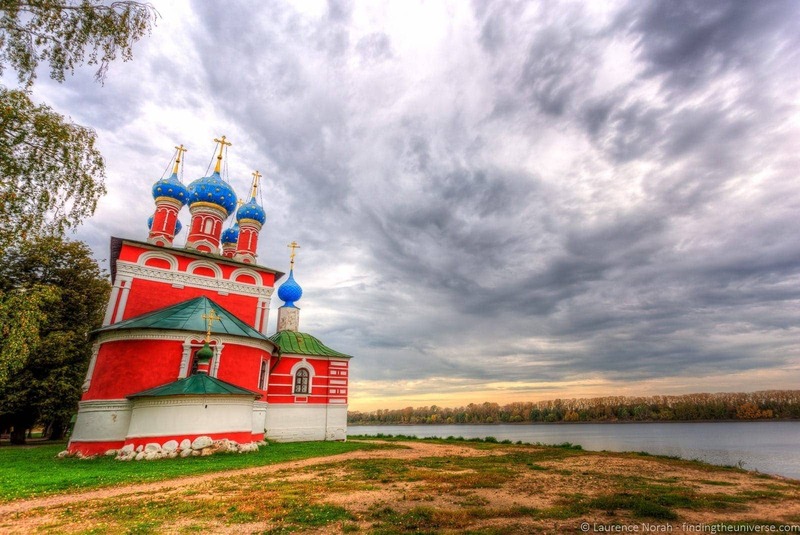 In St. Petersburg and Moscow there were a series of tours included with the cruise price, such as the tour of the Hermitage in St. Petersburg and the Kremlin in Moscow. There were also some optional extras that were paid for separately. 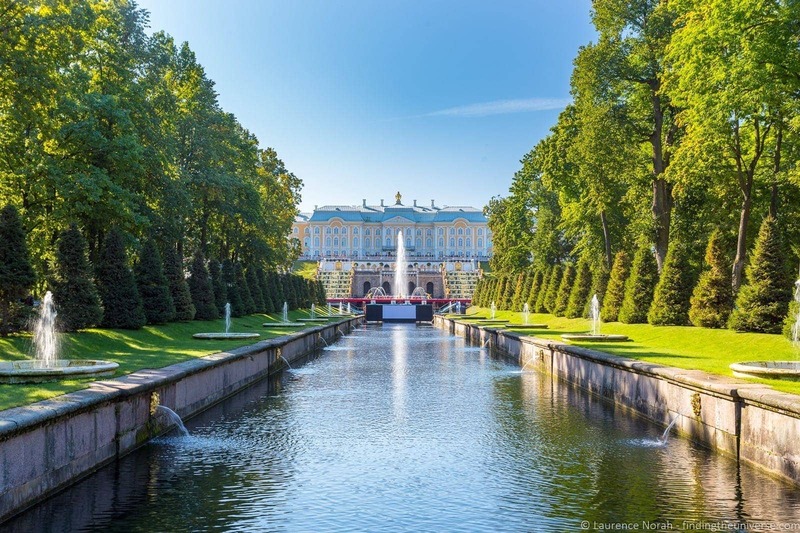 These ranged in price, but were usually €30 – €50 per person, and included items such as a night river tour of the St. Petersburg canals, or a trip to the Peterhof Palace in St. Petersburg. 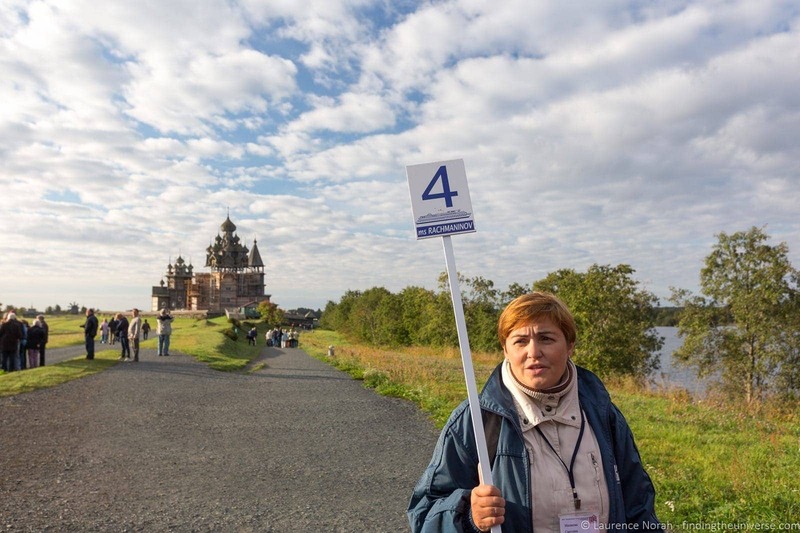 All the tours during the cruise itself were included, and we stopped in five different places along the way, including UNESCO world heritage sites, interesting cities and so on. We’ll be writing up our thoughts in more detail on the tours in a separate post, suffice to say they were well organised, the guides spoke good English, and there was usually enough free time included for a little bit of exploration on our own. 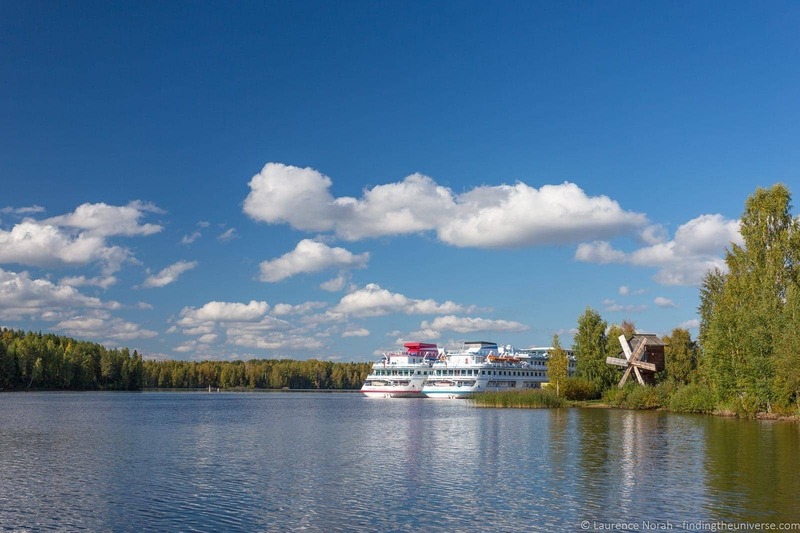 One downside of the cruise was that the parking location of the cruise ship in Moscow and St. Petersburg was quite a long way from the city centre in both cases – 45 minutes to an hour by public transport. Because of this, we ended up taking the optional tours rather than exploring by ourselves. Had we wanted to explore by ourselves, our guides were more than happy to give us maps, directions and advice as to how to get around. There was absolutely no hard-sell on the optional tours – we were given the choice in a quick five minute talk about what was available, and then folks could pick and choose. 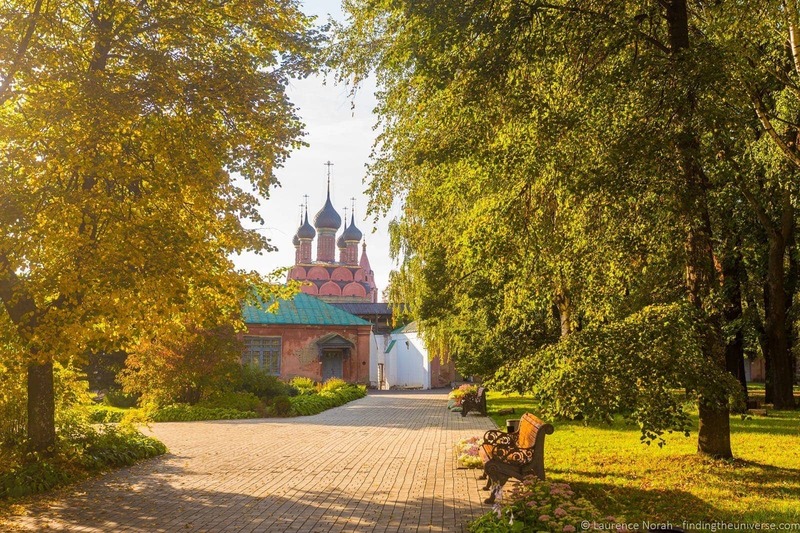 We spoke to some of our fellow passengers, and learnt that many of them had built in extra time at either the end of the cruise to explore Moscow or at the beginning to explore St.Petersburg at their own pace, so do consider that as an option if you’re planning on a trip like this. It wasn’t just about food and socialising on the boat, whilst the scenery glided on by. There were lots of activities to get involved with, should you be so inclined. These included Russian language classes, doll painting, and even learning how to sing traditional Russian songs. 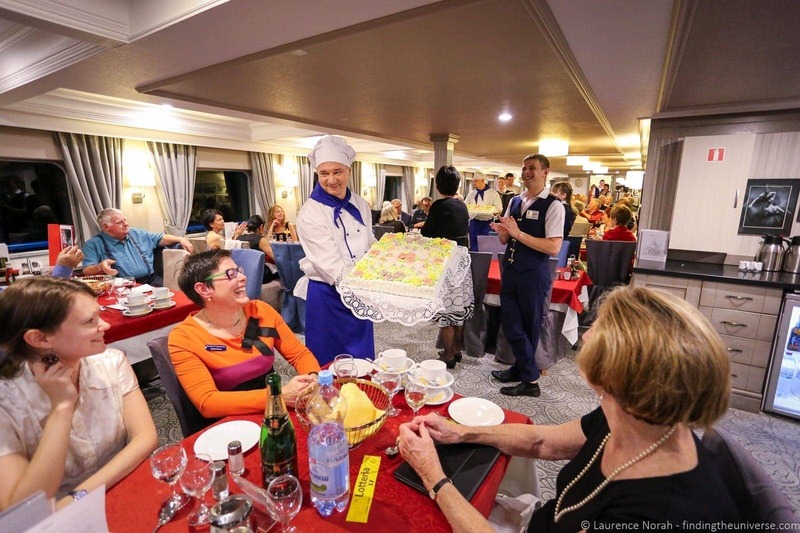 That last one culminated in a final “talent show” in front of the whole cruise ship, with each group of nationalities standing up to sing their favourite song or songs that they had learnt. I went along for that, which was a lot of fun to watch! We didn’t actually take part in any of the learning events, but they were highly rated by the folks we chatted to, and were certainly a good way to spend a bit of time when on board. They were also all included in the price of the trip. We did take advantage of the opportunity to visit the bridge though, which was a lot of fun, and Jess even got to drive the boat for a short while! The only on-board event that wasn’t free (for obvious reasons!) was the vodka tasting afternoon. This cost €15 per person, which was quite a bargain as it included a series of appetisers as well as five shots of varying vodkas, plus lots of information on the different vodkas. I popped in to see what it was like and take some photos, and was given a shot of vodka, which certainly made me sit up straight! 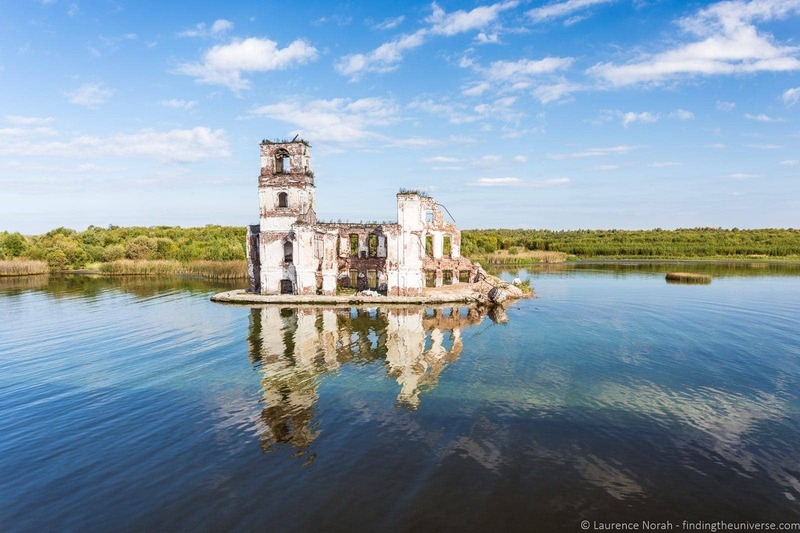 There were also nightly shows, usually consisting of singers or musicians, who would play in the various bars, usually the largest and most ornate bar at the top of the boat. We were initially a little concerned as our cabin was directly under this bar, but they’d obviously done their homework in terms of sound proofing, and we were never disturbed when trying to sleep. 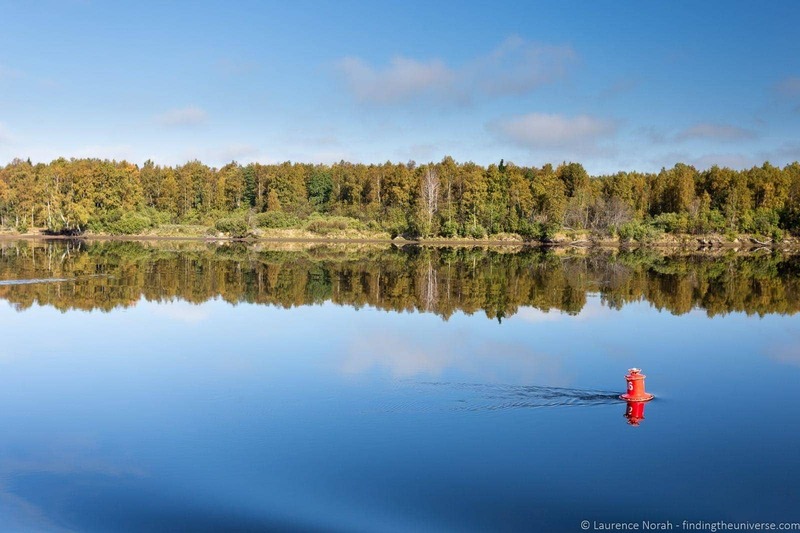 We cruised in late September, a time of year when the weather is usually a bit cooler, as the country shifts through Autumn. Our cruise was the last sailing that Gvidon Tours offered for the year. As it was, we were incredibly lucky, and had magnificent weather for pretty much the entire ten days, much to the surprise of all our guides. Temperatures hovered around 20C (68F) in the daytime, and dipped to around 8C (46F) at night. 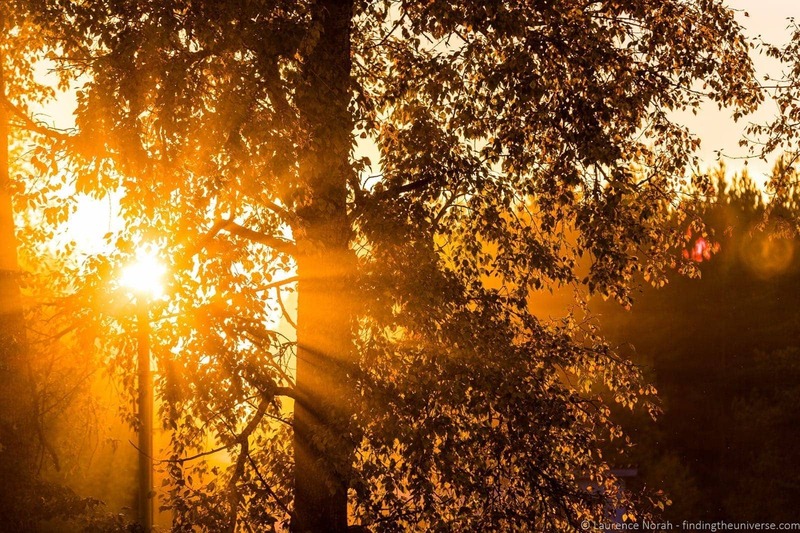 Obviously, visiting in the summer months means you are likely to get much warmer weather, with a higher chance of sun, as well as longer days. 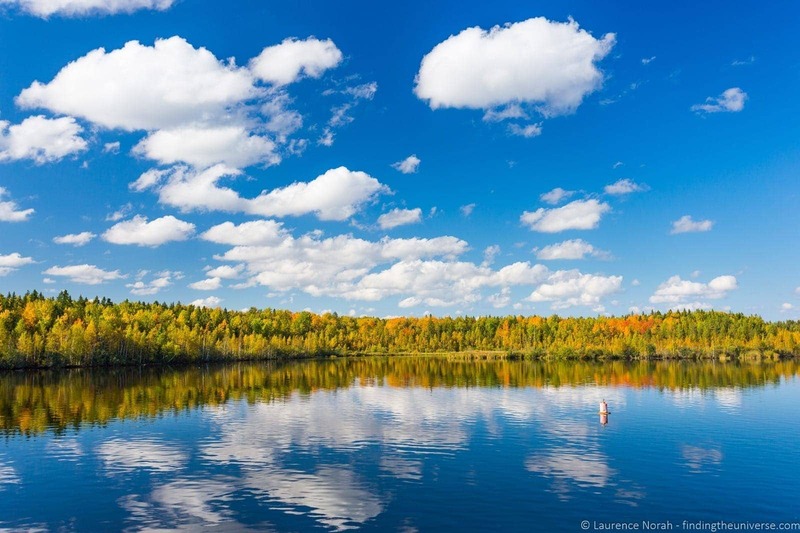 However, the weather in Russia can be unpredictable at any time of year, so you’ll want to bring a range of clothing layers that you can put on and off to suit. A rain jacket would also likely be a good idea. 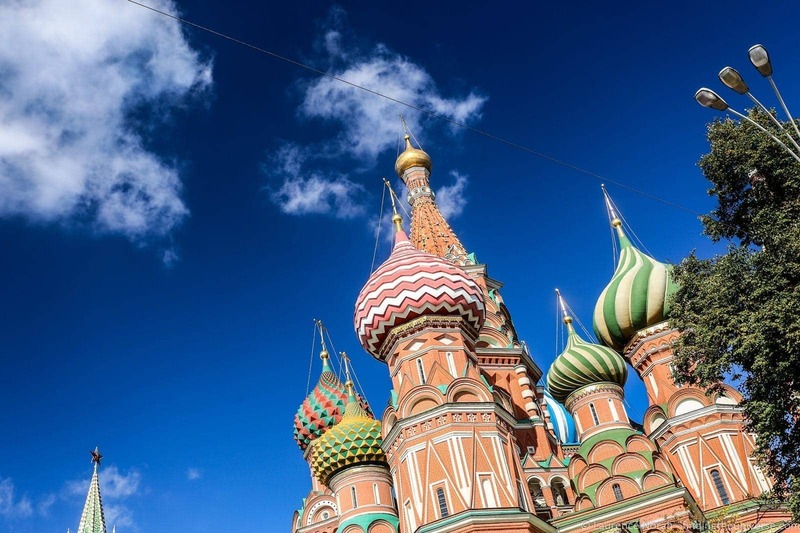 To start with, travelling to Russia means you are likely to need a visa. You’ll have to apply for one in advance and pay a fee. The fee, process and type of visa will depend on your nationality, and you might need a letter of invitation from your tour company. 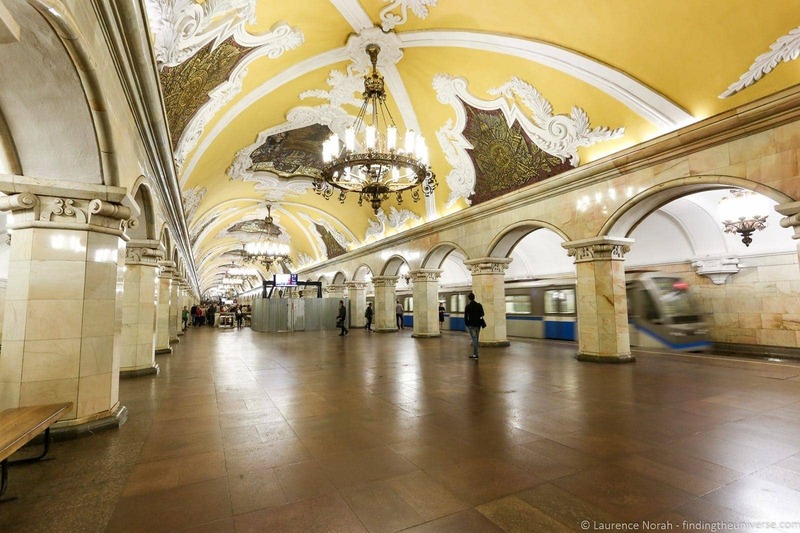 Gvidon Tours helped us with all of this, and we got our visas via the Russian Embassy in the US. Clothing wise, this wasn’t a “formal” sort of cruise, so you don’t need to pack the dinner jacket or evening gowns, although some folks did get a little dressed up for the evening meals and entertainments. In terms of clothing, you’ll want a variety of layers to cover different temperatures. The boat itself was kept warm, but obviously if you venture out on deck in the evenings or at night it might be a bit cooler. You should also consider packing something in case it rains, and comfortable shoes for prolonged periods of walking, as some of the day tours do involve quite a lot of time on your feet. Otherwise, you don’t need to pack anything particularly special – battery chargers, your camera, any electronics, travel adaptors – all the normal stuff. If you want to check out a comprehensive packing list to remind you what you might need, I have a full packing list here. 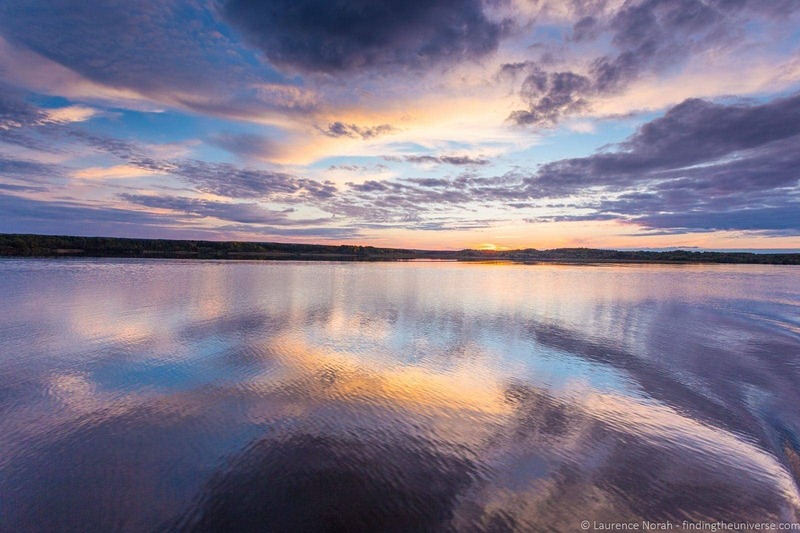 Is a river cruise in Russia for you? 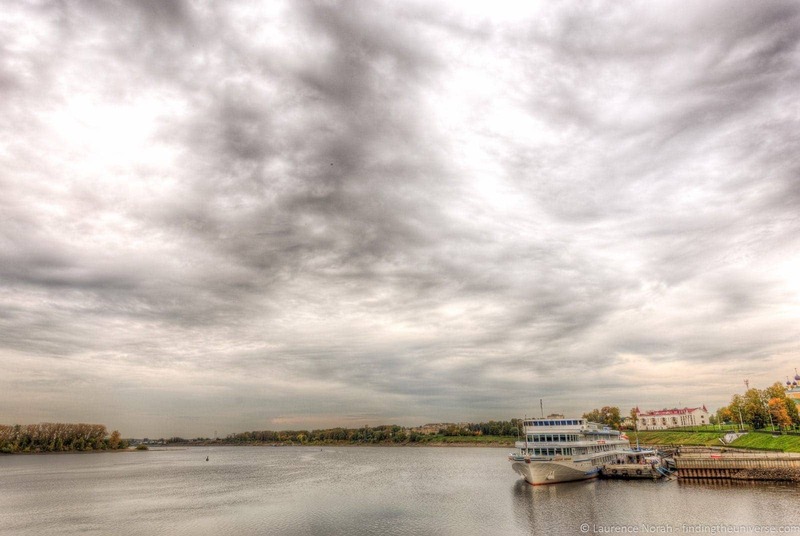 If you’ve never been to Russia, a river cruise is an excellent way to get a first taste of the country in a nice easy way, where everything is handled for you. If you’ve never done a river cruise, well, this one was a lot of fun even to a novice like me. Just be aware that you will need to socialise a bit with other travellers, and that obviously guided tours offer less flexibility compared to independent travel. 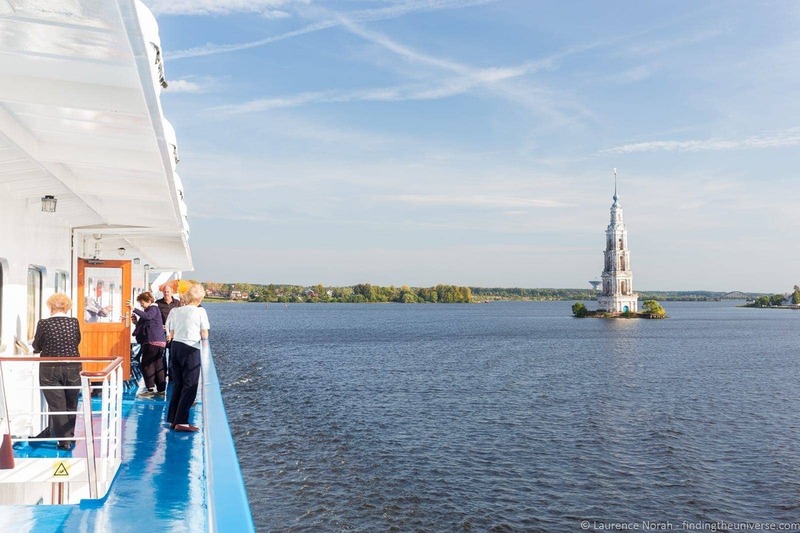 Speaking to a number of the other passengers, some of whom were first time cruisers like me, I found the majority to be pleasantly surprised by how much there was to see and experience in Russia, as well as the general friendliness and welcoming nature of the Russian people. I really enjoyed my first river cruise experience. Obviously it’s tough for me to compare this to other river cruise companies as this was my first trip like this, however I suspect it won’t be my last. What I really loved was how, unlike a bus tour for example, we were able to keep the same room, with our clothes hanging in the wardrobe, and just let the world come to us through the windows of the ship and via the tours we took. No hassle constantly having to load our gear on and off buses, or in and out of hotel rooms. 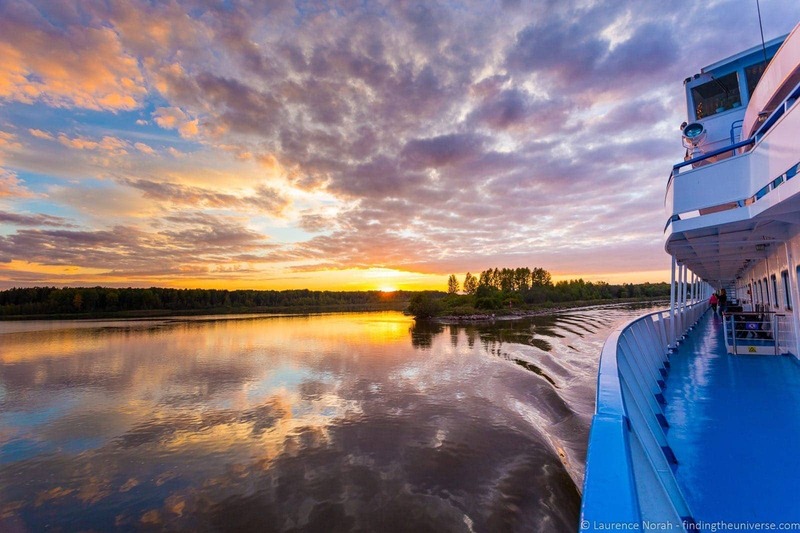 I also loved how the scenery varied every day, the process of going through the huge river locks, and the beauty of the sunsets that we had most nights. 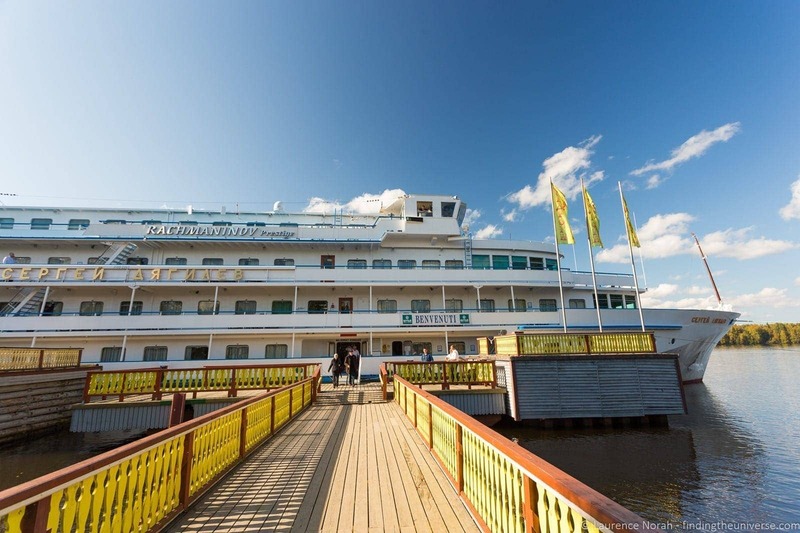 The ship was clean, well maintained, and the staff were wonderfully friendly. 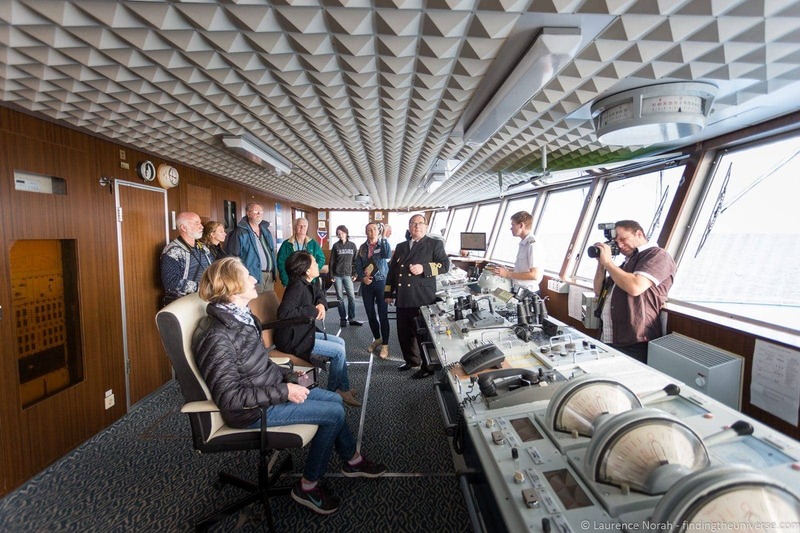 Our shipboard guests provided ample conversation opportunities, and the passing scenery was gorgeous. I was never bored (although I did get a lot of work done! ), but do bring a book or other way to pass the time if you think you’ll need to. 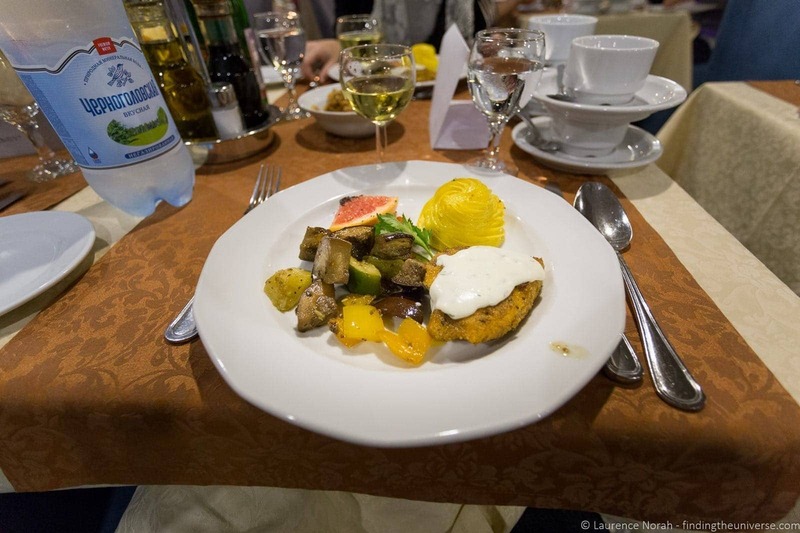 Overall, I am a convert to the river cruising, and in fact, general cruising experience. I can definitely see myself taking this sort of trip again! Our trip was provided complimentary to us by Gvidon Tours who covered the cost of our cruise, food and drinks on board the boat, airport transfers and the optional tours we chose to take during the cruise. Opinions remain our own, see our code of ethics for more on how we choose who to work with. Really great photos! 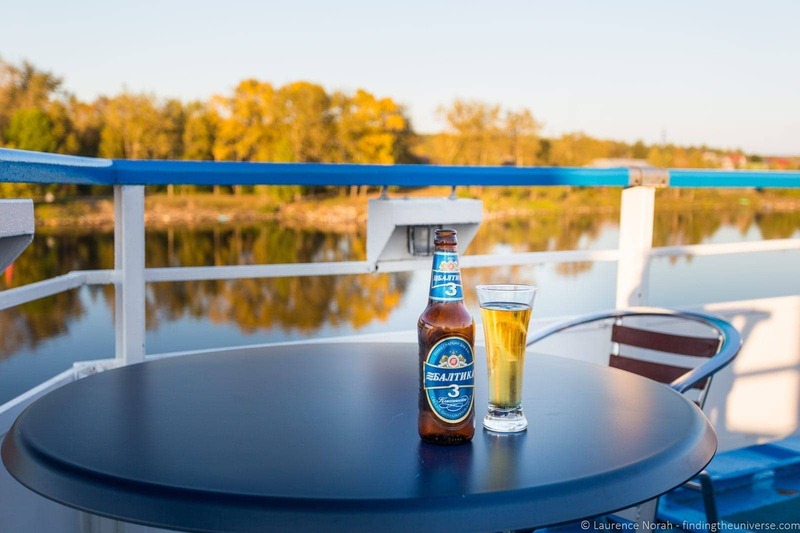 River cruises is my favourite way of travelling. 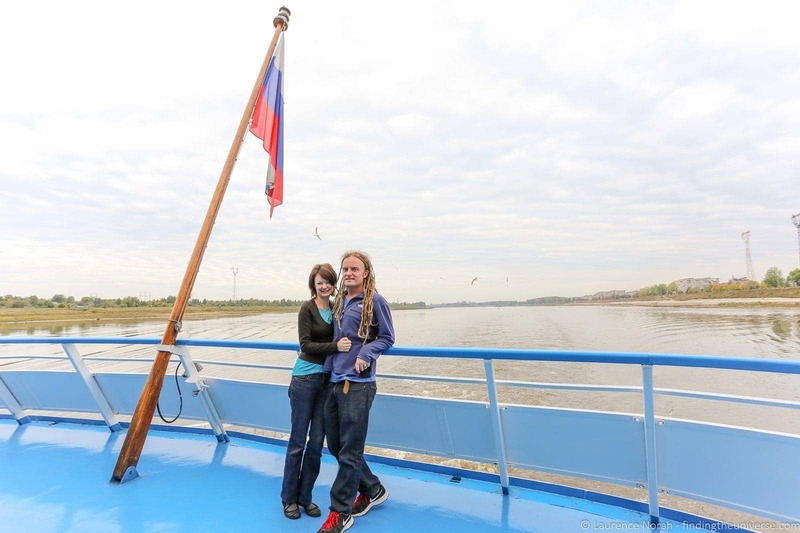 As a Russian native, who has only been on river cruises in my own country (though I’ve taken a few sea trips around Europe), I always wanted to go on one in USA or in EU. But I can’t find any long-ish trips in USA, and even European cruises always seem a little short. 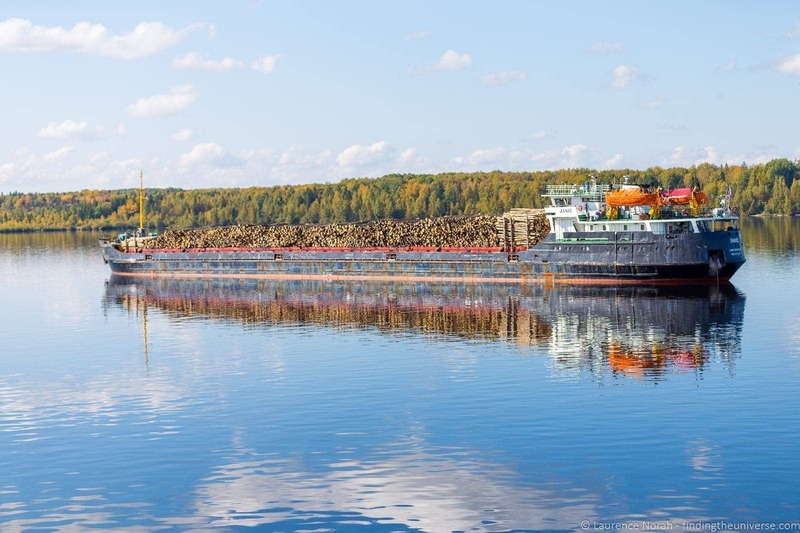 I’m used to 10+ days on the river, but outside of Russia I only seen 5-7 day cruises.